Candidates for mayor speak at a debate co-hosted by The Daily and Northwestern Political Union. At Wednesday’s forum, they spoke about continuing current mayor Elizabeth Tisdahl’s legacy. Evanston mayoral candidates discussed how they would further current Mayor Elizabeth Tisdahl’s legacy while creating unique programs and policies at a forum hosted by Rotary International on Wednesday. 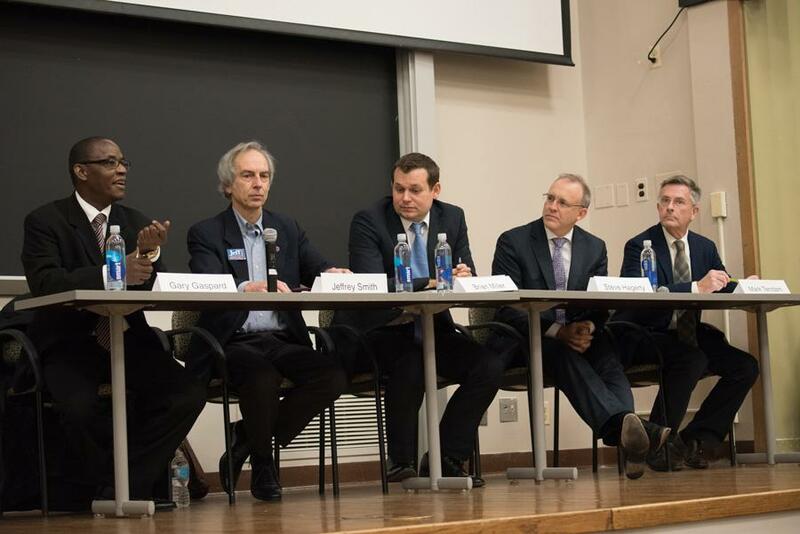 The mayoral forum, the last before Evanston’s Feb. 28 primary, centered on housing affordability, urban sustainability and helping at-risk youth. The five candidates — Steve Hagerty, Ald. Brian Miller (9th), Ald. Mark Tendam (6th), Gary Gaspard and Jeff Smith (Weinberg ’77) — are vying to succeed Tisdahl, who is not running for reelection. Tendam highlighted the success of Tisdahl’s summer youth employment program, but said he would like to see it expand. He wants to get employers to train and hire students without plans or the means to attend college, he said. Gaspard praised Tisdahl for keeping young adults engaged in jobs, and said he would like to move her youth employment program forward by expanding it to a year-round program. The program currently employs more than 700 adolescents and young adults in summer jobs. Gaspard, a 34-year Evanston resident who briefly lived in the United States on an expired visa after immigrating from Haiti, affirmed his commitment to protecting undocumented immigrants. “It would be a good idea for (voters) to send a message to Donald Trump: We Evanstonians, we elected a non-born citizen to be mayor of Evanston,” Gaspard said. Miller called for doubling the number of youth outreach workers to reach more young people at risk of committing violence, as well as increasing their access to mental health counseling. He described the strategy as “targeted deterrence,” which involves reaching out to at-risk youth, building relationships with them and then connecting them with social services. Hagerty, who received Tisdahl’s endorsement, praised her work on making Evanston more affordable for low-income residents. He said he hoped to continue to build on Tisdahl’s efforts to develop affordable housing. Smith said he thought Tisdahl has expanded the mayor’s role, specifically as an ambassador to other towns and to political leaders throughout the state. He also praised her leadership on the issue of sustainability. “Environmentalism is not my only issue by a long shot, but it is foundational to everything else,” Smith said. “If we lose the planet that we aspire to live on, there are a lot of other issues that are going to go by the wayside. Early voting is already open, and the primary will be held Feb. 28. If one candidate receives 51 percent of the primary vote, he will win the election outright. Otherwise, the top two candidates will face a runoff on April 4 to decide the position.